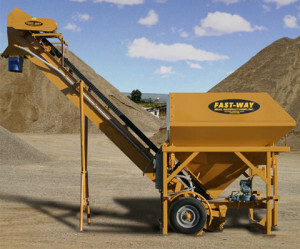 Fast-Way Manufacturing is your go-to company for all of your portable concrete batch solutions. From Fast-Way auger to cement silos for sale, we have the equipment you need for your next construction project. We’ll make sure our Fast-Way equipment is up to safety standards and designed to be extremely efficient. Our new and used cement silos for sale are all top quality to help your project run smoothly—implement them into your process today. Contact us to speak with one of our expert customer representatives. We will work with you to help you determine which portable concrete batch solutions works best for your construction project. The commercial Fast-Way concrete batch plant has many changes. We now offer a 6-yard plant and an 11-yard plant. Each is capable of being towed by a 3/4-ton pickup. We have changed the 24″ conveyor belt to an all-rubber belt including the side wall and flights. This enables materials to be conveyed faster and quieter in addition to eliminating spill-over from the conveyor belt. 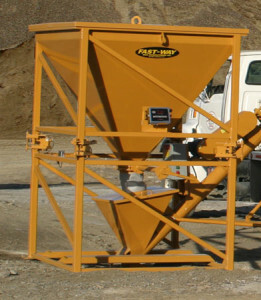 The mobile concrete batching plant scale system is a 4-cell/40,000 lb. electronic system with a 3-inch digital indicator that pivots 180 degrees out providing a clear view of the scale to the loader operator. This aggregate Fast-Way batch plant can be ready to produce concrete minutes after it reaches the job site! 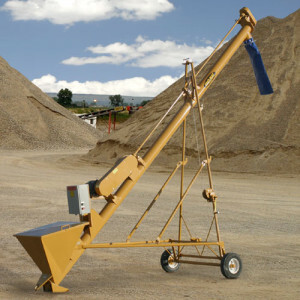 When you use our mobile concrete batching plant, you’ll achieve extremely accurate results. Fast-Way mobile low-profile cement silo (SI-LOW 206 and SI-LOW 210) are the fastest ways to hit the ground running. Designed to comply with legal height and width towing boundaries, the SI-LOW 206 and SI-LOW 210 can be towed with a one-ton pickup. For the process of filling a fleet of volumetric mixer trucks, the SI-LOW 206 or SI-LOW 210 is ready to perform as a portable fill station. The SI-LOW 206 stores 800 cubic feet of cement and discharges the cement with a 6″ auger which produces 500 to 600 pounds per minute. The SI-LOW 210 also stores 200 barrels of cement but has the advantage of increasing cement discharge with a 10″ auger that produces 3,000 pounds per minute. Our newest low profile silo to our arsenal is our 1400 cubic capacity silo with an 8’’ auger that delivers 1,500 pounds of cement per minute. This silo will make your job much easier. There will be on need to worry about running out of cement before you can order another truck load of cement. 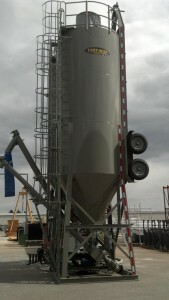 Contact us with any questions you have about our low profile volumetric truck cement silos. Efficient and reliable, our hydraulic and mechanical mobile low-profile cement silos are exactly what you need for your next construction project. This is the Fast-Way to produce concrete. Whether you need to set up on a small mobile job or stationary site, the Fast-Way self-erecting cement silo is the answer. The Fast-Way 275-barrel portable cement silo is self-contained. It is specially equipped with a special designed trailer and hydraulic system, which allows the silo to lie down during transport. Once at the job site, the self-contained hydraulic system will erect the silo without crane assistance. After the self-erecting cement silo has been erected the trailer can be disconnected by removing a few bolts and unhooking four hydraulic quick couplers. Towing the self-erecting vertical portable cement silo at highway speeds can be done easily with a one-ton pickup. Since the silo and trailer fall within the legal length and width boundaries, no oversize permits are required to tow them. In addition to transport, the silo and trailer come completely equipped with trailer brakes, tail lights, stop lights and signal lights. Since all the components stay intact while in transport, there is no major installation on the job site. Once the silo is on location, if your silo is powered by a gas or diesel motor you can erect the silo. If your silo is powered by electricity you will need to hook up your electrical to erect the silo. You are now ready to produce concrete with your Fast-Way portable cement silo and batch plant. If you have any questions about our low-profile portable cement silo, please contact us—we’re here to help. 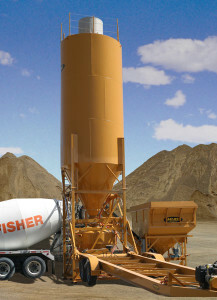 Our hydraulic driven Fast-Way cement Silo comes in an 1175 or 1400 cubic feet capacity. The silos comes equipped with either a 6’’ of a 10’’ hydraulic driven auger, electric brakes, running lights and bag house. The baghouse can be maintained using the ladder with the outside safety hoops and handrail around the top of the silo so it can be serviced safely by your crew. 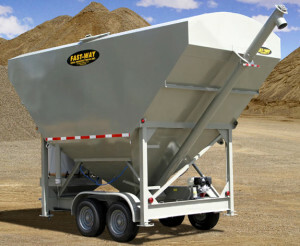 Contact us with questions regarding our portable hydraulic Fast-Way cement Silo 275. Our knowledgable staff will provide you with all the information you need about this exceptional machine. Our “baghouse collector” is one you can trust to help you get the job done right.